We’ve tested the latest an all-in-one desktops and revealed what you need to know about a computer before you buy. Snapshot: The Apple iMac (Retina 4K, 21.5-inch, 2017) is a 21.5-inch all-in-one computer. It has an Intel Core i5-7500 @ 3.4GHz processor and 8GB RAM. What's the performance like? Snapshot: The Apple iMac (Retina 5K, 27-inch, 2017) is a 27-inch all-in-one computer. It has an Intel Core i5-7500 @ 3.4GHz processor and 8GB RAM. What's the performance like? Snapshot: The Dell Inspiron 27 7775 is a 27-inch all-in-one computer. It has a AMD Ryzen 7 1700 @ 3GHz processor and 16GB RAM. What's the performance like? Snapshot: The Microsoft Surface Studio is a 28-inch all-in-one computer. It has an Intel Core i5-6440HQ @ 2.6GHz processor and 8GB RAM. What's the performance like? Think about how you will use your computer both now and in the future and pick the best specifications for the future you when buying. This is important as components in an all-in-one are designed for maximum integration, which means little room for upgrades. The CPU (central processing unit, or processor) is a computer’s “brains”. Each processor will have a number of cores. The more cores, the better a computer will be at multi-tasking jobs. Quad-core processors are the most common. There are two major CPU manufacturers: AMD and Intel. Random access memory (RAM) is your computer’s short-term memory. The more RAM a computer has, the quicker it can process tasks. 8GB will be enough for most users. Ultra-high definition (also called UHD or 4K/5K) screens are high-quality screen resolutions used for movies, gaming and streaming video. Both 4K and 5K provide a better viewing experience than HD. Screen tilt range is how much the screen can tilt forward (negative values) and backward (positive values) from a vertical position. The graphics card is the engine for the display and, like the main CPU, it needs RAM to run. Separate graphics RAM ensures a smoother picture and overall running of the computer as it doesn’t have to share the CPU’s. Touchscreens are common on many computers now, but they can drain power and tax the CPU. DVD/optical drives are going the way of the dodo. In the past few years it’s been rare to find one on a laptop and we’re now seeing the same with all-in-one desktops. An all-in-one desktop has all the components and monitor built into one unit. A stand-alone (or “compact”) desktop is only the component box. A stand-alone desktop requires the purchase of a monitor, as well as other peripherals like a keyboard and mouse, unless you are only upgrading the system. Don’t be fooled by their size though — most tend to be about the size of a toaster — they deliver high performance. 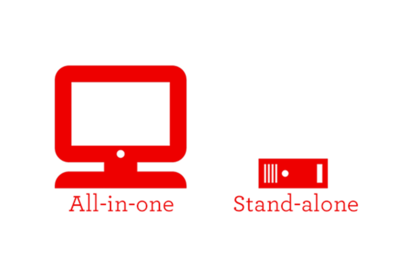 An all-in-one desktop generally comes boxed with everything you need. An advantage of a stand-alone desktop is you can pick the monitor that best suits your needs. You can also connect your stand-alone desktop to your TV. Several operating systems (OS) are available for desktop computers. The most common are Microsoft’s Windows and Apple OS X. Google’s Chrome OS is also gaining in popularity. Linux and UNIX are less commonly known. Each company has multiple versions of their OS in use. Most desktops will have one of these operating systems pre-installed. If you want another OS, you will need to install it yourself or get a technician to do it. There are 2 main types of internal storage drive: the larger capacity, but more fragile, hard disk drive (HDD), and the faster, more robust solid-state drive (SSD). Which you choose affects both your computer’s performance and how much you pay at the counter. Operate by storing data on a spinning disk, resulting in that familiar whirring sound. Have moving parts, which means they are more susceptible to damage. Are relatively inexpensive and easier to manufacture. Their lower cost means they often have large capacities (500GB+), which makes them preferable for budding designers and gamers. Use memory chips, similar to RAM (random access memory), and have faster read and write speeds than HDDs. Popular in laptops due to their compact size, and a lack of moving parts means the occasional knock or drop won’t leave you staring at a blue error. Cost more than HDDs, though this gap is closing. Hybrid or fusion drives are a recent development. These have a small SSD drive for quick access to regularly used data, as well as an HDD for larger or less commonly used data. If your computer is slowing down, don’t give up on it. Some simple maintenance and upgrades could breathe new life into it. Install the latest OS updates: Updates can speed up your computer and plug critical security holes. Clean up storage: Audit your files (it doesn’t hurt that much). Keep your most frequently used files, remove anything you don’t need, and move everything else to external storage, such as the cloud. Remove old programs: Uninstall programs you don’t use anymore. They take up storage space and could be using system resources in the background. Mac OS: System Preferences –> Users & Groups select your account and click on Login Items. While there are some computer components you can upgrade, keep in mind a botched DIY job can void your warranty. RAM: Upgrading RAM can increase the speed of daily tasks, such as web browsing. Storage drive: Replacing an older hard drive (HDD) with an SSD will improve your computer’s start-up speed and performance. This is more complicated as you will need to reinstall the operating system (you’ll probably need a product key) or clone your old storage drive. Graphics card: Replacing the graphics card can give an older computer a new lease of life with fresher, sharper graphics. However, you probably won’t be able to upgrade the graphics card on all-in-one and compact desktops. The CPU (central processing unit, or processor) is a computer’s “brains”. It carries out all the tasks your computer needs to run. A CPU contains of a series of cores. The more cores, the more tasks the computer can do simultaneously. For heavy users, we recommend a quad-core or higher processor. Frequency is the speed (also known as clock rate) at which your CPU can potentially operate. 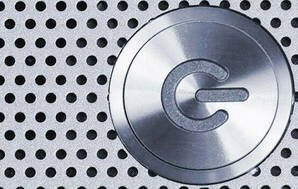 It’s measured in gigahertz (GHz) and each processor core generally has the same frequency. If you’re planning on playing graphically intensive games, the frequency can affect how smoothly it plays. This is the type of architecture (internal structure) that a CPU, and all software installed by a computer, uses. Most new computers and operating systems are 64-bit, while most older computers (pre 2009) are 32-bit. Before installing software, check it’s compatible with your computer’s architecture. 64-bit computers are backwards-compatible with 32-bit software. There are 2 major CPU manufacturers: AMD and Intel. Most computers bought from a retail store will have a processor from one of these manufacturers. Each processor is labelled with a name marking its series (or generation). The latest Intel series are eighth generation, and the latest AMD processors are the Ryzen series. All-in-one desktops usually boast big screens, but how good is the picture? The Retina or ultra-high definition (UHD) screens have more pixels per inch (PPI) than standard HD screens, which means images appear smoother. PPI is different from 4K and 5K, which describe the total number of horizontal pixels. A 4K screen has at least 4000 pixels horizontally, and a 5K screen at least 5000 pixels. An average high-definition screen has about 2000 pixels horizontally. It’s worth noting that the average human eye struggles to notice differences between 4K and 5K screens. Even the best screen looks bad if it’s reflecting too much light. The glossier a computer screen is, the more likely it is to reflect light. This means just because a model looked great in the low light of the store doesn’t mean you’ll get the same results at home. Many all-in-one desktops have touchscreens, which are great for sketching and design work. It can be awkward using a touchscreen in an upright position for long periods, so most all-in-one screens can tilt for easier use. How much they tilt varies, but it’s generally between -6° and 35°. Spectre and Meltdown are two security flaws that have been in the headlines recently. These vulnerabilities can leave your personal data at risk. These vulnerabilities are unusual in that they concern the hardware – specifically the central processing unit (CPU), whereas most security flaws affect the software on your computer. Any device with a modern processor (this means everything from iPhones to Windows computers) are at risk from these two. Meltdown affects only Intel processors while Spectre affects all brands. Programs are made up of a series of individual processes a CPU performs. To save time, many CPUs pre-emptively perform calculations that are the likely next step in a process and the resulting speculative data are stored. This speculative data can contain sensitive data, such as credit card numbers. Meltdown operates by “melting” security barriers between your CPU and these processes, allowing a “bad” process to target and “steal” any speculative data. With Spectre, a “bad” process tricks a “good” one into handing over its speculative data. So far, these flaws haven’t been exploited “in the wild”, but lab tests show it can be done. To patch the flaws, install the latest operating system update for your device and keep it up to date, further patches will be released in coming months. While updates could slow your device down, it’s a small price to pay to protect your information. 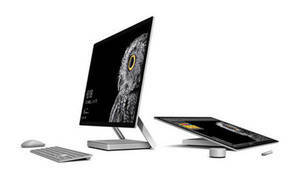 The Microsoft Surface Studio is the company’s first move into the world of stand-alone desktops. It’s aimed at designers and allows you to draw directly on to the screen.